From the London Chronicle -- In connection with the royal jewels, an interesting story has reached the Daily Chronicle about a wonderful Queensland opal that would have been added to the crown regalia had Queen Victoria lived  to see the opening of the Commonwealth Parliament  by her grandson, the Duke of Cornwall and York , in May next. The opal in question for a number of years past has been the property of a well-known gentleman  who was a leading lawyer during the earlier days in Brisbane, and subsequently in Sydney, where he became connected with squatting and mining ventures on a large scale. In 1899, at the time of the conference of the Premiers, the late Sir James R. Dickson  undertook to bring Queensland into the federation. The owner of the opal and Sir James Dickson had been old friends in Brisbane, and in discussing the situation, he said to the deceased statesman: "When the first Parliament of united Australia assembles from all the states, I shall present my opal to the Queen in the name of the commonwealth, as there is as yet no Australian gem of value in the regalia of the empire." Sir James Dickson, who was devotedly attached to the crown, and to the maintenance in the fullest respect of its prerogative in Australia, was greatly pleased with the idea, which also received the warm support of well-known gentlemen holding official positions in connection with colonial affairs. In fact, on being shown the gem from his old colony of Queensland, of which he was the first premier forty years ago, Sir Robert W.G. Herbert , who is an intimate friend of the owner, named it "the imperial opal." The stone was deposited with bankers in London some years ago, where it has lain since, until the owner, who is now in England on a visit, reclaimed it a few days ago, when it was courteously shown to a Daily Chronicle representative at the offices of the bank. The "imperial opal" has as yet been seen by very few people, as it was the owner's wish that Queen Victoria herself should have the first inspection of it. Though many people regard the possession of opals as unlucky -- this has certainly not been the case with the owner of the "imperial opal" -- it is well known that the late Queen Victoria had a predilection for these stones, a knowledge of which fact originally prompted the idea of making the proposed presentation. So far as can be ascertained, Queen Alexandra has no declared preference for opals , and as a consequence no action has yet been taken since the late Queen's death . It is only of comparative late date, as told by Sir Walter Scott, that opals came to be regarded as unlucky on the continent of Europe. Anne of Geierstein  had an opal heirloom which she greatly prized. She knew that dampness affected the brilliancy of her opal, which must have been of inferior quality. When she wore it at church she refused to take the holy water. Sinister rumors in consequence soon spread among the ignorant peasantry, which received apparent confirmation when her child was baptized. At the baptismal font the opal got wet, and Anne cried out, "I have lost my opal!" Two hours afterward she died of heart disease, probably accelerated by her perturbation about the opal, which thereafter came to be looked upon as an unlucky stone. 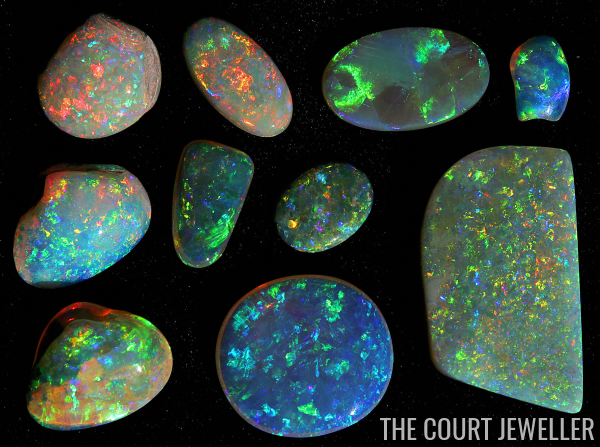 In the ancient days of Rome, however, the opal was considered lucky. Pliny relates how the rich Roman Senator Nonius had a "noble" opal, and prized it for the luck it brought him. It was coveted by Marc Antony, who wished to present it to Cleopatra, and he offered to purchase it from the Senator for a sum equivalent to £50,000 of present-day currency. Nonius, however, refused to sell, and to gain possession of the gem, Marc Antony had him proscribed and a sentence of banishment pronounced against him. Nonius, it is recorded, went into exile, taking his lucky opal with him as his only possession. What became of that opal is not known, but it is certainly not the one shown to the Daily Chronicle representative, as the opal of Nonius was described as being "of the size of a hazelnut," while that intended for Queen Victoria is 250 carats in weight and two inches in length, and of corresponding thickness. Opals, unless extraordinarily fine, have no recognized standard of value, although there is one in the possession of the Emperor of Austria  for which His Imperial Majesty is said to have refused the sum of £50,000. It is claimed, however, that the "Imperial Opal" of Australia is of greater value. Desultory mining for opals has gone on for many years past in several parts of the interior of Queensland, but the returns have not been large, and no other stone in any way approaching the "imperial opal" has yet been found in the state. 1. Queen Victoria of the United Kingdom died on January 22, 1901. 2. The Parliament of the Commonwealth of Australia; it was opened in Melbourne on May 9, 1901, by the Duke of Cornwall and York, who later became King George V. In 1927, the parliament moved to the national capital of Canberra. Today, it meets in Canberra's new Parliament House, which was opened on May 8, 1988, by George's granddaughter, Queen Elizabeth II. 3. George V of the United Kingdom (1865-1936). He was created Duke of York in May 1892; he automatically also became the Duke of Cornwall when his father ascended to the throne in January 1901. On his father's behalf, George and his wife, Mary of Teck, undertook a tour of the empire in 1901, traveling across the globe from Australia and New Zealand to Ceylon, South Africa, and parts of Canada. George was created Prince of Wales by his father on November 9, 1901. 4. The "well-known gentleman" was Maurice Lyons, a solicitor based in Sydney. 5. Sir James Robert Dickson (1832-1901) was the 13th premier of Queensland. Born in England, he emigrated to Australia in the 1850s. He died just twelve days before Queen Victoria. 6. Sir Robert George Wyndham Herbert (1831-1905) was the first premier of Queensland. 7. Queen Alexandra reportedly strongly disliked opals; some have suggested that she bought in to the common idea of the time that they were unlucky. 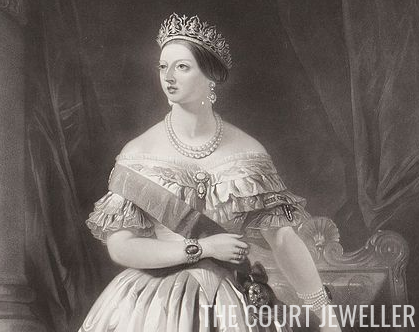 Whatever the reason, she converted pieces of royal jewelry (like the Oriental Circlet) that included opals, having them reset with other stones. 8. Did Lyons ever give the opal to the royal family? I can only answer that question with a big "maybe." Newspapers followed the story for a while, especially in Australia, but I've not discovered any article that definitively notes the opal's fate. Research done at the Royal Jewels of the World Message Board unearthed photos of the Queen Mother wearing a similarly-described opal in Australia in the 1920s, but no definitive link between the two has been made. 9. The title character of Walter Scott's 1821 novel, Anne Geierstein, or The Maiden of the Mist. Here's more from Wikipedia. 10. Emperor Francis Joseph reportedly owned an opal called "the Hungarian Opal." A 1901 Guide to the Treasury of the Imperial House of Austria describes it as being "in the shape of a large drop, mounted in three enamelled clasps and can be used as a pendant."